Not too long ago a friend sent me a link for a video and recommended I watch it. I did. I was shocked and horrified when I realized I was looking at a homeowners’ association. As far as I could see, there was no rhyme or reason to have an HOA in this bucolic part of the country. I have since learned that the property owners in this otherwise peaceful setting each own hundreds of acres of land accessible by dirt roads. We’ve allowed ourselves to be fooled into believing municipal governments just don’t have the money to provide the services real estate tax dollars are supposed to pay for, therefore HOAs are a necessity to provide those services. Not that I believe that for a moment but if I did, try as I might, I could not find any reason to justify the imposition of an HOA on this particular neighborhood. Check out the video and please let me know if an HOA makes sense to you. I am convinced we have lost all sense of reality and sanity in this country. Mary Ann Fordyce joins us On The Commons. 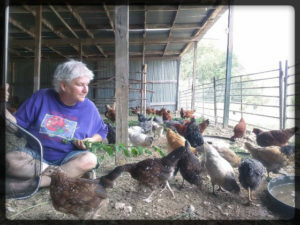 Mary Ann has a chicken business in a rural community in Texas, where many of her neighbors are also business people, several have livestock and there is at least one other chicken businesses owner as well. Not surprisingly this chicken owner was a board member who sold Mary Ann her first chickens and got her started on her business. And for awhile, all was well. But then life in this peaceful corner of the country changed. We’ll talk to Mary Ann and get some of the details of why her dreams came crashing down and how she lost first one house and is now hanging on, trying to protect the second house she and her husband bought, from being foreclosed on. I’ll ask her what purpose her HOA serves and how it protects her when her closest neighbor is a mile away. I’m sure no one will be surprised to hear what happened to the only common area these property owners had. Maybe the fate of that park is the answer to why an HOA was even part of this neighborhood? Check out Mary Ann’s web site Blue Star Ranch . This lady is determined to help educate housing consumers about the perils of HOAs. Mary Ann–I am so grateful you got on Shu’s program. She is right though–every time we think we have a law that might protect us, it is spun around by the vendor’s to serve their best interests and just ends up hurting the hapless homeowner again. It takes courage to continue to try and make a difference in this crazy institution…I admire you for that courage. There are others that have been harassed by members of this hoa. Outside the radar of any official pursuit. I will contact the senators and House of Representatives for both the state of Texas and the US regarding the abuses of HOA’s and demand laws restricting the HOA’s or Outlaw the HOA’s.